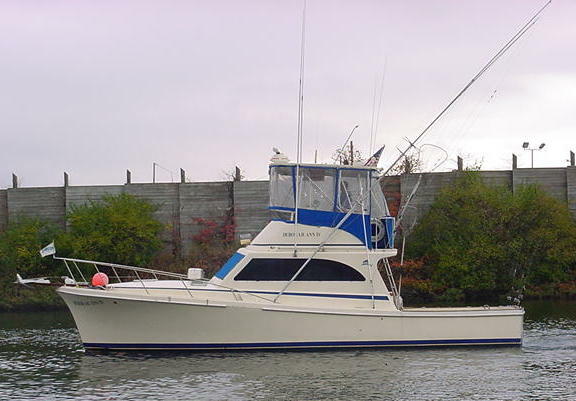 "Bring Your Lunch, Catch Your Dinner"
Clean, safe and comfortable 38 foot Harris Custom Built Sportfishing Vessel. Twin Volvo diesel engines. 630 horsepower. All Coast Guard certified safety gear and electronics onboard. Coast Guard licensed Captain 100 Ton, Master of Inland Waterways license for over 35 years. Has fished Long Island Sound for over 40 years. Leaves Stamford 8 AM returns around 4:00 PM. Leaves Stamford 8 AM returns 12 noon. Leaves Stamford 1 PM returns 5 PM. Leaves Stamford 4:30 PM returns 8:30 PM. Fishing for in season: fluke, flounder, bluefish, blackfish, porgies, sea bass, striped bass. All bait, tackle, rods and reels provided or if you prefer bring your own gear. Parties of 1 to 6. Trips to Greenwich Harbor, Mansion tour from the water, day or twilight, maximum of 6 passengers, call for details. Beat the heat of summer with a 3 hour TWILIGHT CRUISE. Fireworks from the water 4th of July. Fishing trip price includes: all bait, tackle, rods and reels for a maximum of 6 passengers. *Special 3 hour cruise to Greenwich Harbor. Water view of the Greenwich shore line. Prices do not include gratuities for the deckhand, 20% is customary. A $100 deposit is required to hold a charter date. Please make checks payable to: DEBORAH ANN FISHING CHARTERS, LLC and mail to 231 Middle River Rd, Danbury, CT 06811. SORRY NO CREDIT CARDS. Deposits are refundable only if trips have to be cancelled due to severe weather and an alternate date can not be mutually agreed upon. Deposits are not refundable for parties that do not show up on the date and time reserved. 2018 season opens Saturday April 28, 2018 and closes Wednesday October 31, 2018.